Shadow: Being implacable. Finding fault. Nitpicking. Refusing to settle down. Running away from problems or confrontations. Saying, “It’s my way or the highway!” Harping on past mistakes and disappointments. Threatening to quit as a strategy to get your way. Story: The Main Character finds his or her everyday life suddenly unrewarding. The Main Character sets off to find his or her destiny. Relationships. If a relationship fails to supply what you need, consider looking elsewhere. Occasionally, a little time apart can restore perspective and reveal true character. Don’t be afraid to be alone; it’s okay to be your own person. Work. Threatening to quit is never productive. Dedicate yourself wholeheartedly to a task…or move on without fanfare. A persistent feeling that “something’s missing” should tell you something. Know when to say “No!” to overbearing bosses. Spirituality. Consider the value a retreat might offer. Spend time alone in nature. By stepping outside of your daily routine, you automatically heighten your awareness. When you return to your every day world, you’ll see it with fresh eyes. Personal Growth. As children, we ridicule “quitters.” As adults, we need to realize the time does come to throw in the towel. In your own life, what habits or attitudes need to be abandoned, cold turkey? Don’t think of it as quitting; see quitting as a step toward a new beginning. Fortune Telling. Someone’s “stepping out” on you, now or in the near future. Maybe it’s time to quit talking about the problem and just move on. When? Between February 19th through 28th. Stacked Chalices. The RWS-inspired versions of this card frequently depict eight stacked Cups, arranging to emphasize the ninth cup’s absence. What do you lack emotionally or spiritually? How willing are you to pursue it? The Retreating Figure. 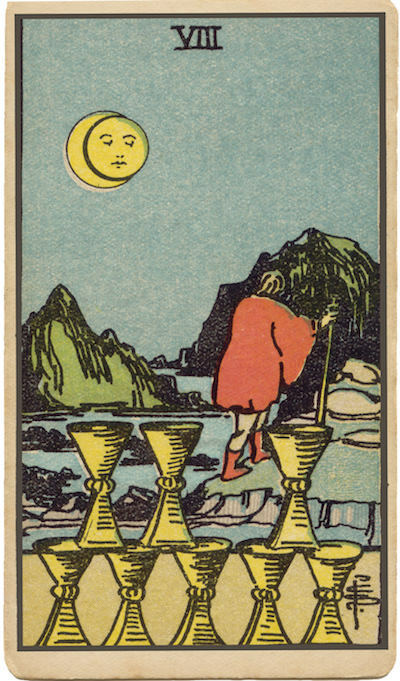 On many versions of this card, a weary figure walks away, heading toward the horizon. In your own life, what do you need to walk away from? What new experiences or insights might you gain from doing so? Starting Again. What risks are inherent in starting over? What would be lost? What benefits might you gain from a fresh start? The Marseilles Image. What a labor (eight) of love (Cups) this arrangement must have been: such careful balance, such deliberate symmetry! Still, there’s room for growth. What labor of love should you undertake today? What do I need to leave behind once and for all? If I left in search of “more,” what would I be looking for, exactly? How might a retreat enhance my perspective?